Most people don’t know, when joining Scentsy for just $99, you receive a Start Up Kit it can be valued well over $200! Yes, it’s just $99, for the kit, and you also become a Scentsy Independent Consultant. You’re are allowed to sell the most popular authentic Scentsy candle products available in the world. 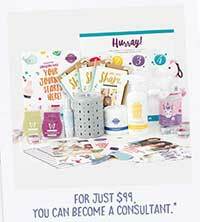 The consultant Start Up Kit is amazing and the contents will varies depending on the date and if it’s a special offering. No matter what the exact start up kit contents, rest assured you get everything you need to get a start selling Scentsy. You really can start earning income almost immediately. Party Testers (approximately 80 each) – These are Scentsy scented wax samples used for sharing the many different fragrances with your customers, friends, family, and anyone you meet. Believe me, when people smell all the amazing authentic Scentsy fragrances, they get excited and buy! Demonstration Products – This includes an authentic Full Size Scentsy Warmer, a cute little Scentsy Buddy, Scent Pack, Scentsy Wax Bar, Skin Care or Cleaning products, and even a couple of light bulbs for good measure. Business Supplies – (50) Scentsy Catalogs, (25) layers By Scentsy Catalogs, Discover Scentsy DVD, New Consultant Start up Guide, Scentsy Planner Calendar, Stickers, (100) Business Cards, (100) Party Invitations, (100) Order Forms, (5) Host Envelops, (25) Buy Brochures, (25) Host Brochures, (25) Join Brochures, Consultant Folder, and Welcome Letter. Please remember, the kit contents vary and the items listed above will not exactly match what you will receive. The above list represent products or supplies that you can actually hold in your hand, but there’s so much more! We’ve already mentioned the shopping website, but you will also have access to your own online Scentsy business workstation from which to conduct all your business. You’ll have access from anywhere, as long as you have a internet connection. Your workstation is like GOLD! This is also where you’re hear all the latest Scentsy news and download your marketing pieces. Certainly, Scentsy start up kit is a must but depending on which consultant you join with, that person will be your sponsor and show you exactly how to get the very most out of your kit. If you join Scentsy through me I will be your sponsor and I’ll show you all the ropes!